Remove the glass from your frame, clean it and set it aside. 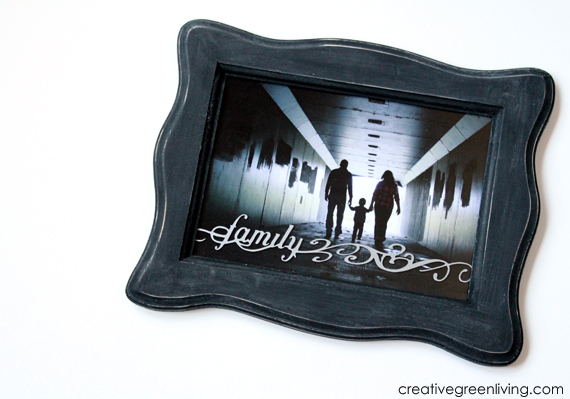 Use the black paint to paint the frame. Set it aside to dry. Open Cricut Craft Room and pull images from the cartridges listed below. If just using the Best Images of 2008 cartridge, open the family graphic and several swirl shapes. Images from left to right: Best Images of 2008: Family; Joys of the Season: Mug; Joys of the Season: Mug (inverted); Ultimate Creative Sampler: Image 24. Adjust the image sizes and angles as desired, assembling a graphic that measures approximately 1.25 inches x 7 inches for use in a 5x7 frame as pictured. 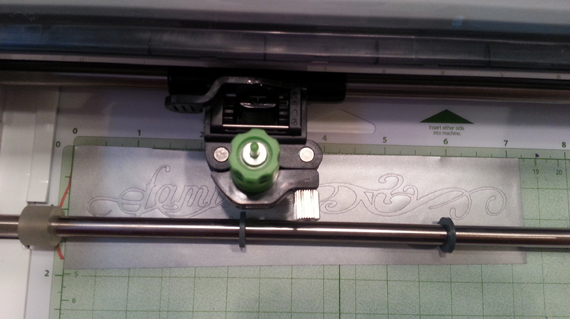 Once your graphic is ready, adhere a piece of 2 x 7.25 silver vinyl to your cutting mat and feed it into your Cricut. Select Cut in Cricut Craft room and follow the prompts on the screen to adjust the blade depth and pressure to the recommended settings for vinyl. Using a hook tool (or a toothpick if you don't have one), "weed" out the excess vinyl from the image that you do not want to use. Keep in mind that any vinyl that remains on the backing sheet will be transferred as-is to your glass. Once you vinyl cut out matches your deigned graphic, cut a piece of 2x7 vinyl transfer tape and place it over the vinyl and backing sheet. 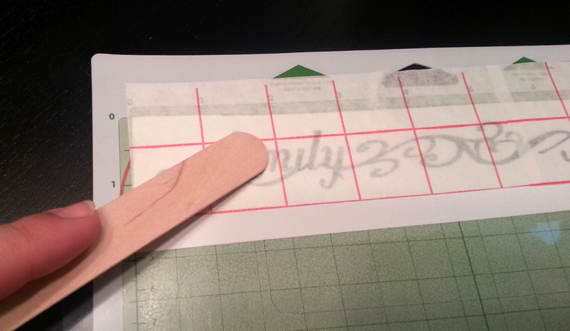 Use the popsicle stick included with the transfer tape to help it adhere well to the vinyl with no bubbles. 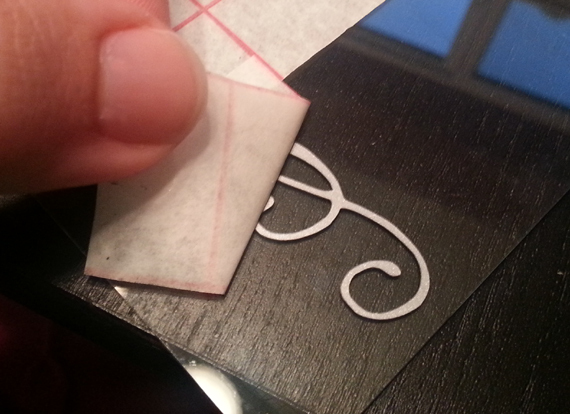 Peel the transfer tape away from the backing and mat. Position the transfer tape on the glass of the frame and rub with the popsicle stick to adhere. Slowly peel up the transfer tape to reveal your image on the glass! Once the frame is completely dry, use the sand paper to rub paint off the edges and scuff up the appearance of the surface. Once you are happy with the appearance, wipe or blow away any dust and re-insert the glass into the frame. Insert a family photo and you're done! disclaimer: I was given a Cricut Mini and access to Cricut cartridges by Provo Craft in hopes that I will use them to create projects to share on my blog. I have not been compensated for creating this project or writing this post. Project is my own original creation. All thoughts and opinions are my own. Links in supply list are my affiliate links.